Ward Lloyd Cuff (August 13, 1914 – December 24, 2002) was an American football halfback and placekicker in the National Football League (NFL) for the New York Giants, Chicago Cardinals, and Green Bay Packers. 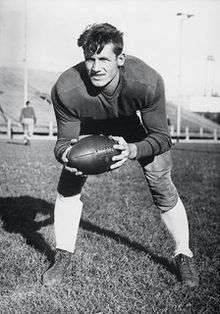 He played college football at Marquette University and was drafted in the fourth round of the 1937 NFL Draft. After his NFL career, Cuff worked for many years for the Boeing Corporation in Seattle before moving to California. Among his volunteer contributions to youth, he coached placekickers, Rick Redman and Bob Struble, at Seattle's Blanchet High School in 1959–60. His number 14 was retired by the Giants, although owner Wellington Mara gave Y.A. Tittle permission to wear it during his time with the Giants from 1961-64. It was retired again in honor of both players. 1 2 Palmer, Ken (December 27, 2002). "Ward Cuff dies". nyg.scout.com. Retrieved September 26, 2012.